A short but apt reminder about foods that help keep the winter cold & flu away. For my daily cold & flu protection: I combine the wonderfully hydrating dark greens (rich in Calcium, Vitamin E, D & K, Magnesium, Potassium, insoluble fiber) with yellow, orange or red produce (rich in Vitamin A, Bs, C and soluble fiber)... Plus more micro & macro nutrients that I could go on & on about! Fried Egg Salad is an awesome breakfast! One of my favorite breakfasts is a fried egg salad. I squeezed a little volcano lime juice on the avocado and make whatever type of salad I crave, topped with a fried egg. It is amazing how much nutritional value & sustained energy this dish provides! Sometimes I also add a slice quinoa toast for fyll “happy belly” satiation. It is yummy, hearty, refreshing & sustaining all at the same time! Spicy Avocado Pasta time! I was craving pasta, nachos and pizza. Hmmmm... Was I in the throes of a winter induced carb frenzy? Oh yes, no doubt! ...and my craving had to be satisfied. I cooked a little brown rice penne pasta. Then I sauteed some diced avocado, green beans and fresh tomato wedges on high heat with olive oil, garlic, cumin and chili powder. I added the pasta and pan fried until the noodle started to become golden and a little crisp. I squeezed in some lime juice, let it reduce, then added some medium-heat double roasted salsa and a little water. After I plated the meal, I sprinkled shredded cheese and enjoyed! Brown rice or Quinoa pastas are much less starchy than the white wheat version. The green beans were cut to the same size as the pasta, so it felt like I was eating a lot more of the carbs I really wanted than I actually did. Now my tummy feels like I had a feast! Add Whole Grains & Greens To Your Breakfast! Last night's dinner becomes today's breakfast. 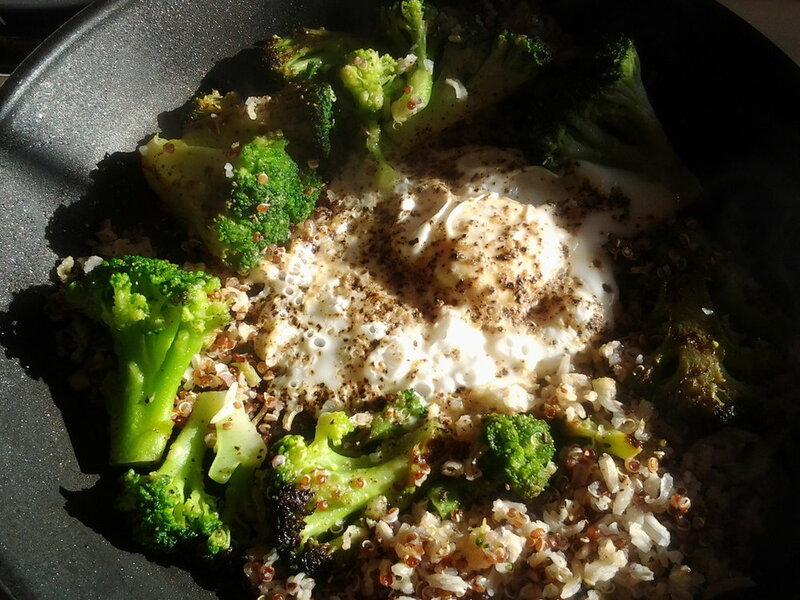 Brown rice with quinoa, broccoli and a fried egg. Easy to cook & so good! This breakfast offers a terrific nutritional base with loads of protein and fiber to boost. How would this compare to a fried egg with toast & butter? Try it and decide for yourself.